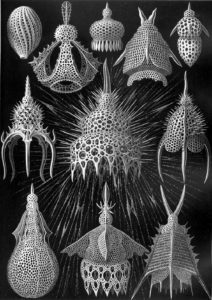 Make your own sea gooseberry! The sea gooseberry is a type of ctenophore, which means “comb jelly.” They’re an ocean invertebrate that typically eat other tiny ocean creatures. Here’s what we’ll be making, along with the image that inspired it. 2. Inc 6 times (12). 6. (inc, 2sc) * 4 (16). 18. Sc2tog 8 times (8). 19. Sc2tog 4 times (4). 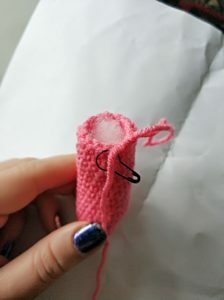 Cut yarn, pull taut, and use a tapestry needle to hide tail inside the form. 4 sl st; 6 sc; 5 sl st.
2 sl st; 2 sc 2 hdc, 2 dc, 2 hdc; 2 sc; 2 sl st.
Repeat these steps to make as many ridges as you like. 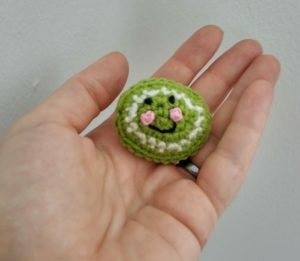 I made three. 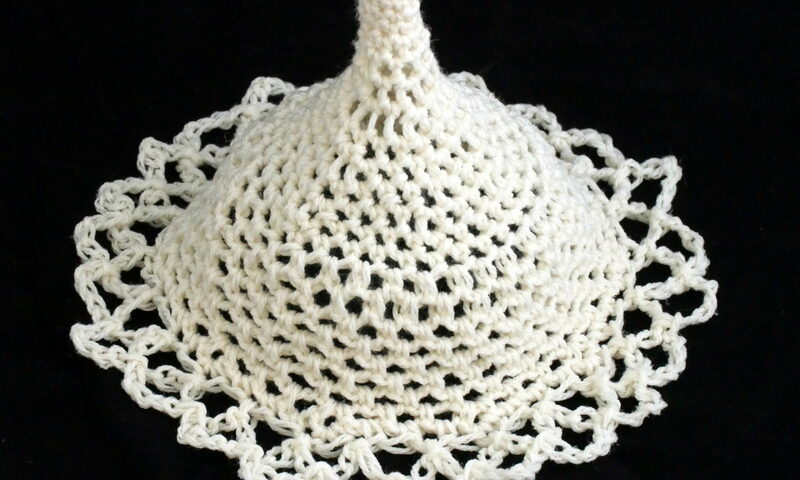 Using the novelty fluffy white yarn, thread a tapestry needle with a 12″ length of yarn. 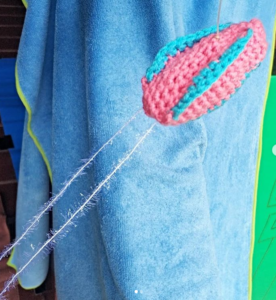 Simply insert the needle in the “bottom” of the ctenophore, just off the center of the ending four-stitch circle, and push it out a bit on the other side of the center. 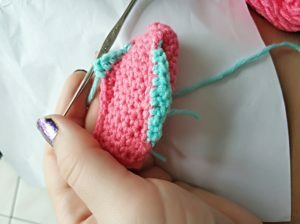 Pull the yarn out and even out both sides. You can tie it in place if you want, but as long as no one tugs too much on the tentacles, they should stay in place just fine. Good job! 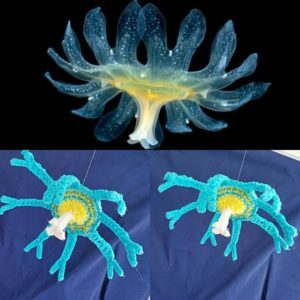 Make your own cute little ocean bacterium! Let’s make a prochlorococcus bacterium! 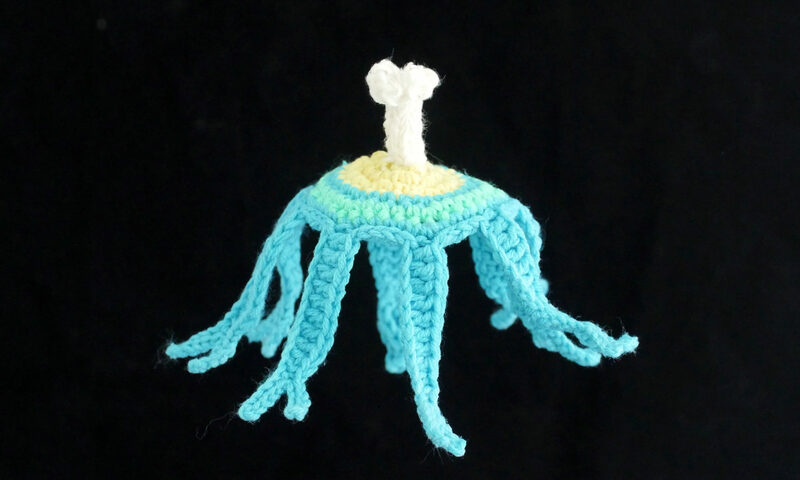 I didn’t know anything about this bacterium, but according to Wikipedia, it is a photosynthetic picoplankton (cute!) 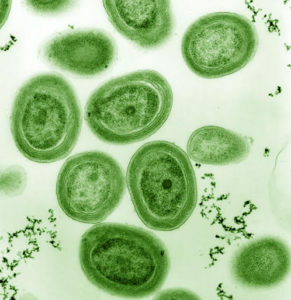 which is “among the major primary producers in the ocean, responsible for a large percentage of the photosynthetic production of oxygen” (https://en.wikipedia.org/wiki/Prochlorococcus). Without these little buddies, life as we know it would be very different! Here’s what we’ll be making and a picture of what inspired it. 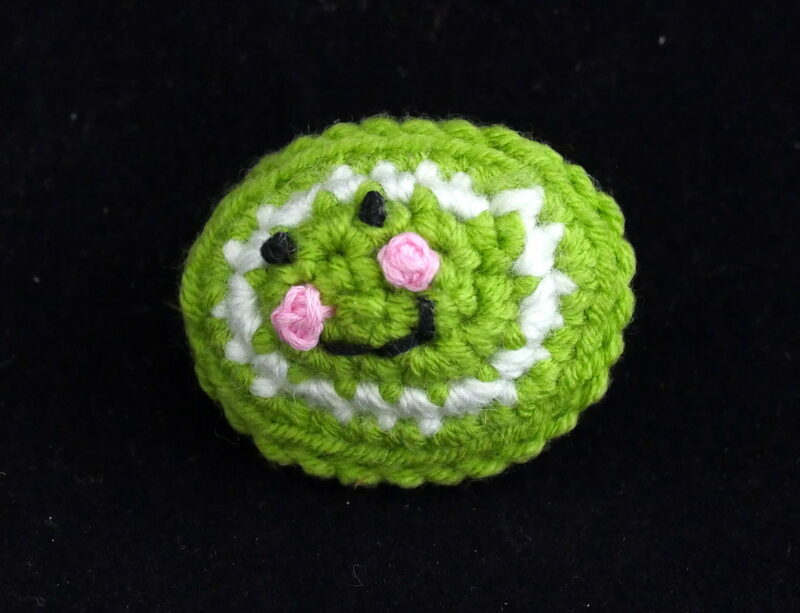 I thought I would add a little extra personality to the bacterium with a face. You can decide whether you want to include that or not. 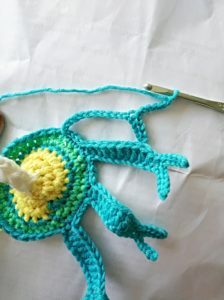 We will make two sides of the bacterium, embroider a cute face on one side, and slip stitch them together. To make the oval shapes, we make a chain, work along both sides, and then increase on each end in each row. Sc in 2nd ch from hook, and in each of the next 2 chains. Work 2 more sc in the same space as the last sc. Turn the piece so you can work on the opposite side of the foundation chain. Sc in the bottom of the second sc you did on the other side. 2 sc in the bottom of your first sc on the other side. You now have 8 scs – 1 on each side and 3 on each end. 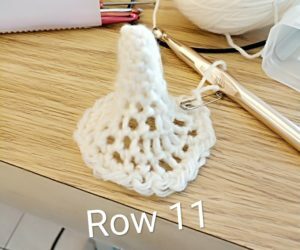 Changing to white yarn, chain one. In same st, inc. 2 sc, (inc, sc) * 3. 2sc, (inc, sc) * 2. 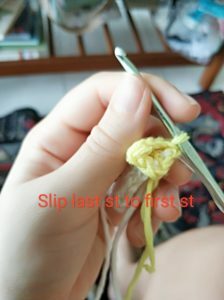 (20) Skipping chain st, sl st first st to last st.
After finishing first oval, cut and weave in all ends, but do not cut green yarn after finishing the second oval. Embroider cute little face on one side! I used french knots for the black eyes and pink cheeks and backstitch for the black smile. Check the image at the top if you need more guidance, or google around for other ways to embroider faces if you prefer a different style. 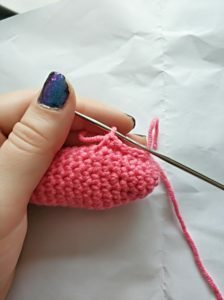 Once you’re done with the face, start to slip stitch the two sides together. 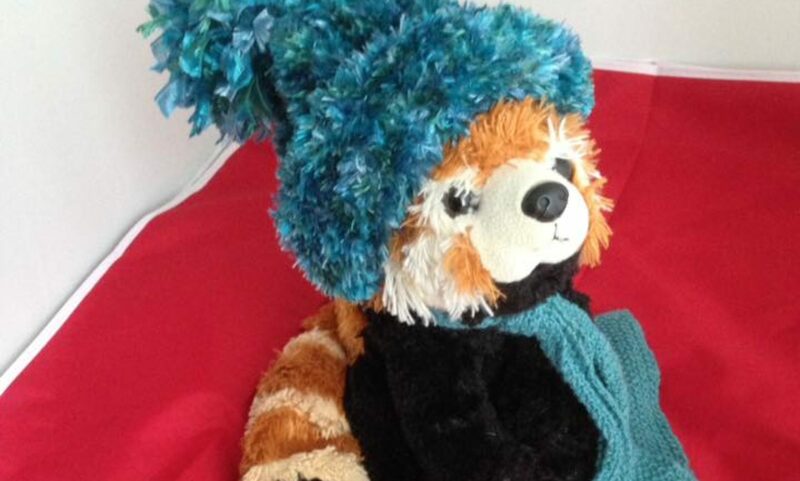 When you have just a few stitches left, stuff the form with polyfill or yarn snippings. Once filled, slip st the rest of the ovals together. 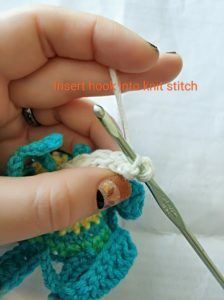 Cut yarn and pull the end into the form with your hook. Done! 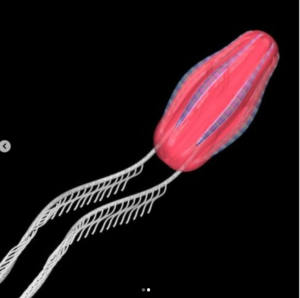 The ephyra is a stage in the life cycle of a jellyfish. 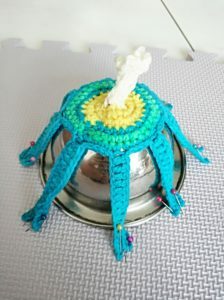 Check out these instructions for how to make your own! The following images are my crafted ephyra interspersed with the images that inspired it. 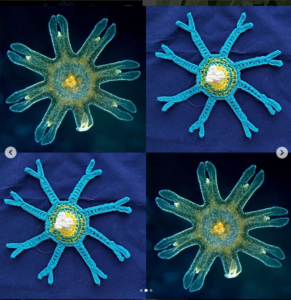 I used yarn held with stretch jelly elastic (like the kind used to make stretchy beaded bracelets) in order to mimic the translucent quality of the ephyra. 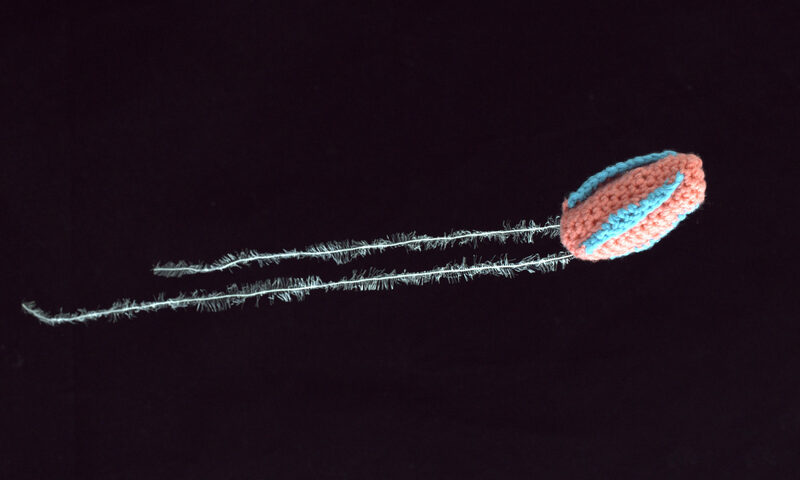 With white yarn and elastic, cast on 4 knit stitches, leaving a long tail, about 16 inches. 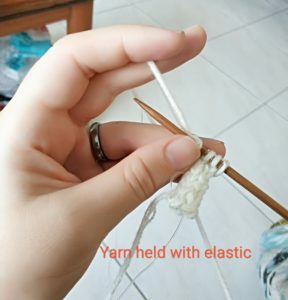 8. switch to crochet and yellow yarn with elastic. 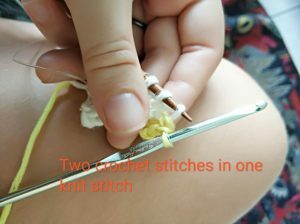 With stitches on knitting needle, insert crochet hook into first stitch. 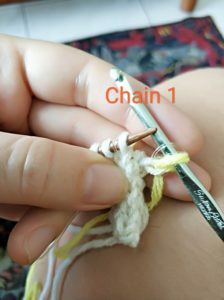 Chain one with yellow yarn and elastic. 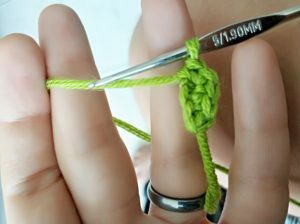 Increase by doing two yellow single stitches in the one knit stitch. 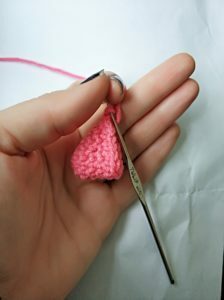 Remove stitch from knitting needle once you’ve increased the knit stitch. 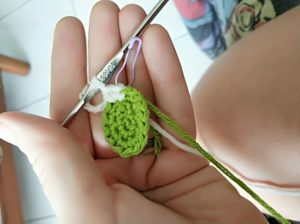 Repeat crochet increase in the next three knit stitches and put knitting needles away. 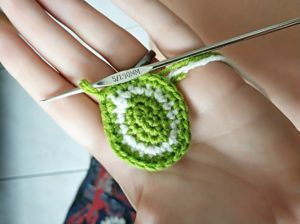 Slip stitch into first crochet stitch, joining the round. (8). 9: increase in each stitch (16). Work in blue and elastic for remainder. Sk ch st, sl into first st. Chain 16. Working back along secondary chain, 5 sl sts. Now returning to the main chain, 1 sc, 1 hdc, 8 dc. At end of chain, sl st into the next st of the circle. Sl 4 more, then repeat from “chain 16” to make 7 more arms. When you’ve slipped into the st just before the first arm, fasten off. 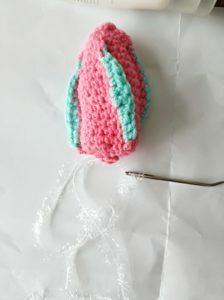 Go back to the tail of white yarn and elastic that you left at the beginning of the I-cord. (Sl into the next st, ch 3 and sl back into the same st) * 4. 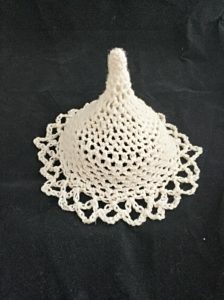 When you’ve finished 4 petals, finish off and weave in all ends. Once you’ve made the solution and let it cool enough so you can touch it, immerse the ephyra form fully in the solution. Let it sit and soak for about a minute. In the meantime, prepare a clean area where you can stretch it over a mold and pin it down. 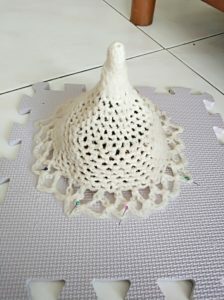 I like to use a blocking mat for knitting. 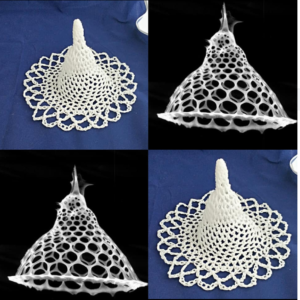 Assemble a few different shapes that will fill out your radiolarian. I just used a bowl that fit ok. 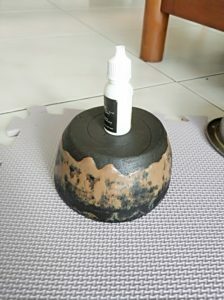 Stretch the ephyra over the bowl/mold, fan out the arms, and pin the edges down with rust-proof straight pins. I recommend that you try to pin the two sections of the arms close to each other so they form less of a v-shape and look more like the picture we’ve based the ephyra off of. Let the form dry, under a fan if necessary, unpin, and detach the ephyra carefully from the mold and blocking board. Good job! !